Your search is over. You have come to the location for continuing education courses for water operators in Wyoming. We have what you need, training courses that will help you complete the CE hour requirements for license renewal and educational materials that are both informative and applicable to the real world. 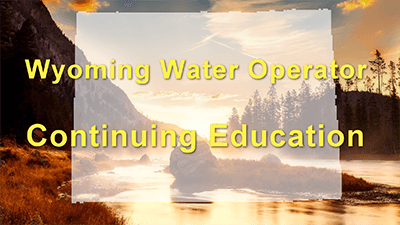 What are the continuing education requirements for Wyoming water operators? Each certificate requires 24 hours of continuing education every three years. 8 of the 24 hours must come from the core topic area. 2 of the 24 hours must be training on rules. The remaining 14 hours can be on core or elective training. All of the classes listed are approved as core topic areas for Water Operators. Save on our 22 Hour Core and Elective CE Package. Includes: Surface Water, Source Water, Disinfection, Corrosion, WD Overview, Pipelines, Meters and WD Quality. Save with our 8 Hours of Core Topic CE Package. Includes: Surface Water (3 Hours), Corrosion (3 Hours), and Membrane Processes (2 Hours). This course will fulfill 4.5 of your required hours for Wyoming water operators.